What Should Be Included in Dogs' Food? Your dog is your best friend, so it makes sense that you want to give him the very best--and that includes food. But with all of the options out there, how do you choose? First of all, keep in mind that there is no one-size-fits-all food that is best for every dog. There is not one single food that will give every single dog the shiniest coat, brightest eyes, highest energy level, and best digestion. Each dog is unique, so while a particular well-formulated, healthy food may do well for most dogs, it could cause problems such as gastrointestinal upset for some dogs. Here is some useful information on what to look for in dog food. Some consumers wonder whether dogs are carnivores. In reality, dogs are actually omnivores. This means that they need meat as well as plant-based foods to stay healthy. Dogs should be fed a mix of proteins, carbohydrates, and fats, as well as fiber. There are 8 main ingredients that are particularly important for dogs. Protein in dog food can come from a variety of sources, including chicken, beef, salmon, or rabbit. Protein can also come in the form of "meal", which is either dehydrated meat or ground animal parts. Meal can actually be just as nutritious as meat protein sources. The most nutritious dog foods will list the protein source twice--once at the beginning of the ingredients list, and again right before where the fat source is listed. Many dog foods include grains as a minor ingredient. Grains can improve the digestibility of dog food and also provide a good source of energy. While some dogs may have a grain allergy, its occurrence is actually very rare in dogs. Because gluten is a common intolerance in people, many pet owners may be tempted to choose gluten-free foods for their dog. However, this is unnecessary. Vegetables are actually not a required element in a dog's diet, but they can provide a nice source of vitamins and minerals. If you choose to add vegetables to your dog's food, make sure that you do not include garlic, onions, or mushrooms--these can be highly toxic to dogs. Like vegetables, fruits are not totally necessary, but they can be a nice supplement for your dog. In particular, fruits like apples and blueberries can be a good source of fiber. Steer clear of grapes and cherries, as these are toxic to dogs. Fats are another thing to keep in mind when wondering what to look for in dog food. Fats are a very important element in your dog's diet. Fats provide energy and flavor, encourage vitamin absorption, and keep your dog's coat healthy and shiny. The most common fats found in dog food include soybean oil, cottonseed oil, vegetable oil, fish oil, pork fat, and chicken fat. The healthiest dog foods offer omega-3 and omega-6 fatty acids. Vitamins and minerals are very important to your dog's health. In addition to benefiting the immune, digestive, and metabolic systems, vitamins and minerals keep the nerves and blood cells healthy. Important nutrients include B vitamins (biotin, pyridoxine, riboflavin, thiamin and beta-carotene), vitamin A, and vitamin E.
This next ingredient may be surprising when wondering what to look for in dog food. Despite popular belief, by-products are not actually bad for your dog. By-products in dog food include things like organ meats, which are a great source of nutrition for dogs. By-products do NOT include things like hooves or hair. When choosing dog food, opt for natural preservatives over artificial preservatives. Natural preservatives: Common natural preservatives include tocopherols and ascorbic acid. These ingredients improve the taste of your dog's food and make it less likely to spoil. However, natural preservatives do not last as long as artificial ones, so make sure that you always check the use by date on your dog's food. Ethoxyquin: This preservative was originally developed as an herbicide. It has been known to cause cancer, blindness, immune system disorders, and kidney and liver damage. Propylene glycol: This is actually an ingredient found in anti-freeze. When consumed, it can reduce moisture levels and beneficial bacteria levels in the digestive system, potentially resulting in cancerous lesions or intestinal blockage. BHT/BHA: Butylated-hydroxyanisole (BHA) or butylated hydroxytoluene (BHT) are two preservatives that have been linked to kidney damage and cancer. You should check the label on your dog's food for a nutritional adequacy statement. This will say something along the lines of “This food is complete and balanced for all life stages”. Keep in mind, as well, that puppies and senior dogs may have different nutritional needs than adult dogs--feed them accordingly. Besides the nutritional adequacy statement, look for feeding trial information on the dog food label. This information explains how the adequacy statement was established. Foods that have undergone a feeding trial are preferred, as this indicates that the food has been fed to dogs that remained healthy while eating it. AAFCO stands for the Association of American Feed Control Officials. While membership in this organization is voluntary, choosing foods that have the AAFCO label ensures that your dog is receiving a diet that meets his basic nutritional needs. Keep this in mind when deciding what to look for in dog food. 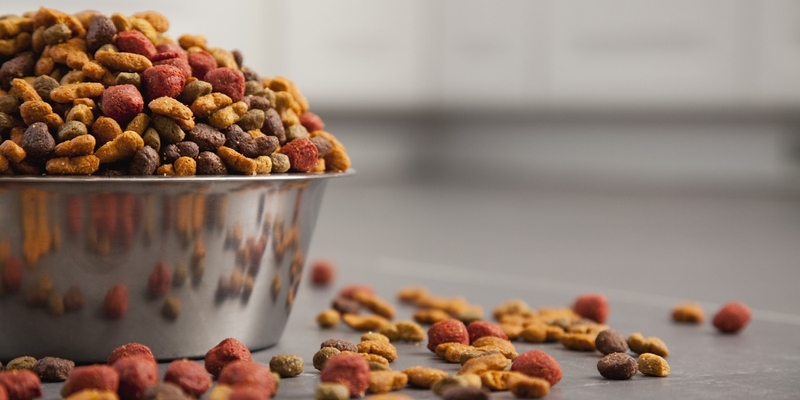 Corn and corn syrup may be added to dog food. They are good supplements if used properly. But there are potential risks. Corn syrup is added to dog food to help sweeten the palate, but unfortunately it can lead to long-term health problems for your dog such as weight gain, diabetes, and mental problems. Corn is often used as an inexpensive filler in dog food, but it can potentially develop a dangerous mold or fungus that can even lead to death.